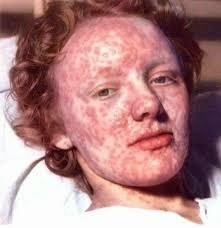 Queen Elizabeth the First had smallpox in 1562 and it nearly killed her. I find it dubious Moffat knew this when he set her portion of 50th in that year. I could rant for days about lack of research when using an historical figure, but I won’t, it’ll go in the blog. I’ll simply write it in myself and hope I do history a little more justice while weaving in the fantasy. William Cecil and Francis Walsingham waited outside Her Majesty’s chambers as her ladies in waiting silently hung the red cloth around Her Majesty’s bed. She too was swathed in the red stuff as she lay in her deathly state, the disfiguring red bumps of the pox rendering the monarch completely unrecognisable. Walsingham and Cecil knew they must prepare for the worst. The country was in no shape for a new monarch. Their queen, however difficult at times, or steeped in controversy over her refusal of suitable husbands, and her blasphemous protections of her religion, had done well thus far, and four years of reign was too soon to lose her. France, too, was… problematic. Already at war with Protestant factions on the continent, Elizabeth’s untimely death could spell disaster if the French believed England ripe for the taking, and without a husband or true heir, the future was uncertain at best, and grim in all realistic foresight. War seemed inevitable. On this much, Her Majesty’s advisors agreed, and it must be prepared for in all haste. On top of all, a witch— and not just any witch, but one no one believed could possibly exist— had been caught wandering around the palace. The palace! The man was oddly dressed, and unmistakeably did not belong as he meandered through the halls of tapestry and paintings, and had somehow managed to breech all their security. How many guards had either missed him entirely, or been put under a spell? They couldn’t be sure, but it was a dismal thought. How many others could pass so easily through their fortifications, and at such a sensitive time? How soon would news spread to France that they were so wholly unprotected? This man – this witch – was a harbinger of calamity. His Majesty, King Henry, had sentenced the abomination to die before their current ruler had drawn her first breath. Most agreed this impossible man the drunken ravings of a thwarted love affair, and gave it no credence. If it had not been for Henry’s furious insistence upon court painters replicating the witch’s likeness (and his stolen bride’s,) they would never have recognised the wretch; never have believed such a fantastic story to be true. Now, of course, they must consider the witch’s presence to be the blight which brought all the current misfortune upon them. His very existence, still full of youth and vigour, though all those who lived when he last plagued them lay dead and buried, proved his guilt. He would be beheaded and burnt, but in him, too, lay the only hope of returning their queen to them. It was blasphemous, Walsingham warned, a sin for which there could be no repentance. God did not suffer witches to live, nor spare the hell fire to those who consorted with them. Cecil agreed, but what were their two souls in exchange for their queen and country? Perhaps, a merciful sentence would persuade the fiend to undo what had been done. Perhaps, some time on the rack would be a method proving more efficient. In any case, having seen to the care of their suffering queen, it was time to confront the witch. The boys shared a wary look. “Apes get jumpy when frightened,” Leather insisted. “Right,” they chorused, then put on a burst of speed. They ducked down another hallway where another two guards stood, swords drawn. Allowing furious momentum to carry them, the two boys crashed into the guards, grabbing their wrists and angling blades away from themselves. Leather and the Dandy added their respective weights to the scuffle, and soon had the two guards unconscious. The sounds of many heavily shod feet grew in their wake, and they took off, full tilt, once again. As if by some tacit agreement, the Doctors seemed to know where they were running, so Torin and Lios followed without question, until they came to a dank chamber full of boats. Traitor’s Gate lay opposite them, and the boats sloshed gently with the eddying current. They all set to work, obstructing the entrance with anything they could find. A wicked gleam entered Leather’s eyes. “You’re not blowing up any part of the Tower of London,” Lios told him firmly, without taking his eyes off the one in the bow-tie. The wicked light shone from six sets of eyes. The oldest Doctor moved over to his eldest son and began removing the vortex manipulator from his wrist. “I’ll do it and catch you up,” he said lightly. Torin yanked his arm away. He nodded reluctantly and clenched his jaw tightly. “I’m staying with Torin,” Lios informed them. “Lios—” the eldest Doctor began. “He’s perfectly safe in my care,” the man said gently to the agitated blond. The other Doctors exchanged dubious glances but remained silent. Lios swallowed hard, but nodded. The remaining three Doctors sprang into action, untethering a boat, wading out to the gate, boarding the vessel, and taking up a paddle respectively. After sharing a look full of promises and portent with Torin, Lios followed suit and got into the boat. “You’re very close,” the Doctor remarked casually as they disappeared through the wooden gate. “We are. Close. We’re very close. All of us. We’ve always been together,” he said, rummaging in his pockets and pulling out a corkscrew and an ice pick. He held both up for the other man to inspect. The Doctor chuckled and began boring holes in the boat nearest. “Now you sound like me,” the Doctor remarked blandly, moving on to the next vessel when he was satisfied the first was taking on enough water. The Doctor’s eyes wandered over to where the Bad Wolf Girl stood, leaning against a stone pillar, and watching. She grinned in her eerie, lupine way and shrugged. “I’m all ears,” the Doctor replied. For some reason this made Torin fidget and smooth down his hair at the sides of his head. “Why are you here?” he asked after a few hesitating moments in which all he did was chip at the bottom of the boat he had selected. The Doctor cocked his head. The Doctor grunted but made no further comment. “You’re very clever, young man,” the Doctor smiled sadly. The Doctor, who had halted in his work, stared at him with his mouth agape. The Doctor heaved another sigh and went back to the sabotage. Already he could hear voices and shouts in the distance. Their time was running out. “Your sister is what?” The Doctor all but leapt to his feet in his agitation. “I’m telling you that impossible doesn’t exist,” Torin insisted vehemently. “And if I can’t?” The Doctor watched his latest boat sink with dread eating at his insides. Shouts behind the barricade made them both jump. They each moved to a new boat and began working furiously. If someone had told the Doctor that this decision could have gotten harder when he crossed the desert, he’d have laughed bitterly in their face. He could’ve laughed at his own stupidity. The Doctor sat up, his eyes narrowed in Torin’s direction. “Shada? What, the prison?” Torin made a face, slamming the ice pick through one of the floor boards of the boat he was sabotaging. “If she shares this insane plan with the right people, we may not need to.” The Doctor smiled. “You don’t,” the Doctor pronounced with finality. A curious light bloomed within the blue depths of this younger version of his father’s eyes. If Torin had been the sort who analysed these sorts of things, he might have said it looked very like hope.